While in Perth, ON last August, I learned about Bracelets of Hope, an initiative to raise the money necessary to build a medical clinic for a Village of Hope in Harare, Zimbabwe — all by selling handmade bracelets. Even more impressive is that the initiative was dreamed up by a ten-year-old. I met with Carrie-Anne Bauer and her mother, Pamela, in a park in Ottawa last August (2007) and conducted this interview. I’ve been beating myself up for not having released this interview sooner. That was before I received an update from Pamela this past Friday (April 4, 2008) . Her update inspired me to publish the interview now. I think it has more impact this way. 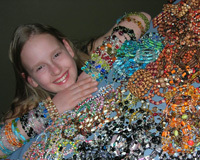 Photo of Carrie-Anne and the Bracelets of Hope provided by Pamela Bauer. Truly one of your best shows, and one that shows that the children of today can and are truly the hope of tomorrow. This was a very touching and moving interview. It was a great interview, I was supprised when I learned that the initiative was dreamed up by a ten-year-old. What beautiful jewelry! Thank you for your sharing. Great story. It’s something important to spread the word about. check your link tho; the bracelet of hope url has a typo, or has been squatted on by someone.